This is the Fine Wine…. The Fine Wine and Goumet…. This 6-part series visits a different local bodega each week and show you the vast array of delicious wines produced in this area. Join us as we take a look at the beautiful countryside around these exclusive wine growing areas, along with all the knowledge you need to enjoy the wines here in Spain. For oenophile’s or just for those of us who like a glass or two, this programme is a must that will leave your mouth watering and wanting more. You can also now buy a DVD of the entire series for just €25 – a perfect gift for beginners and connoisseurs alike! The Costa News Group is the first newspaper group in Spain to promote the ideals of the Europe-wide ‘Wine in Moderation’ initiative. This initiative is designed to send out the positive message of the importance of responsible use of wine, and alcohol in general. I’m proud to be associated with this ideal! where you’ll see regular tweets about what I’m up to and where I am in the Wine World. It’s an ideal way to find out what’s hot and what’s not in Spanish wine! Discounted Wines @ Pepe La Sal, Moraira/Calpe Costa Road! Just a reminder – the Heat Gold FM Wines of the Month, sponsored by Pepe La Sal, are on sale now until 25th Feb with a 1€ discount one every bottle bought! Torres, San Valentin, white semi-dulce is selling for just 3·50€; and Torres Celeste Roble, Robera del Duero, is just 4·95€! The wines are clearly marked, just take them to the check out and ask for the Heat Gold radio discount! You can listen to presenter Eric Taylor tasting them with me, live in the Heat Gold FM studio on Monday 25th Feb at 2:20 – 3pm; and you can join in too, by texting/skyping/e-mailing whist we are On-Air! Heat Gold FM’s Wines of the Month mean discounted wines – for you! Check out Heat Gold's Wines of the Month - and save money too! Hola everyone – and a very Happy New year to you all! I’m now back in the office after our annual UK sojourn and I’m raring to go! I’ll be organising a number of wine related events throughout 2013 and I do hope you’ll be able to join me! The first, rather exciting, event, which has money saving advantages for you too, is the On-Air wine tasting that I’ll be presenting with Eric Taylor, on Heat Gold FM on Tuesday 22nd January, at 14:20 hrs – www.heatgold.fm and 94·1. 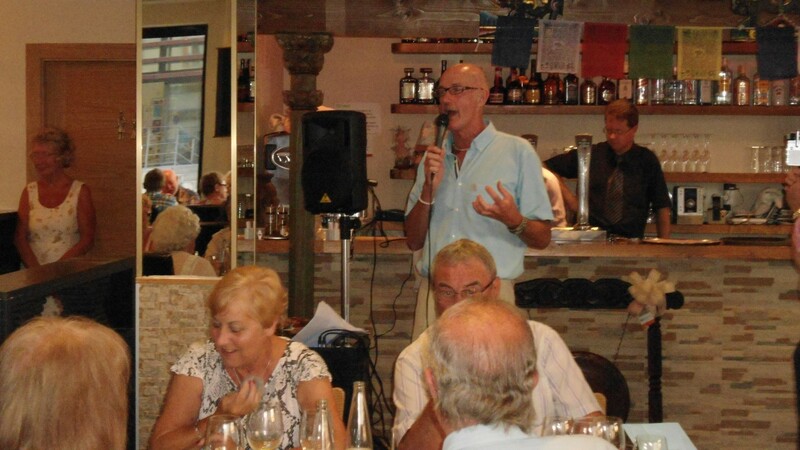 We’ll be tasting and discussing the Heat Gold FM Wines of the Month, as supplied by Supermercados Pepe La Sal, Moraira. These wines are now available to buy, from the Pepe La Sal store on the Moraira/Calpe Coast Road only, with a 1€ discounted price per bottle – a saving of about 15%!! Hurry though, they’ll only be discounted up and including 22nd Jan! They are the super, fruit driven new release Bodegas Torres dry white wine from DO Rueda, called Verdeo, whose normal price is 5:45€; and the lovely Torres red from Rioja, Ibéricos Crianza 2009Tempranillo, normally priced at 5:90€! Al you’ll need to do is mention Heat Gold FM Radio when you go through the tills and although the full price will appear at first on the ticket, you’ll find at the bottom that there will be a discount of 1€ per bottle, taken from the total cost of your shopping! Obviously the more bottles they sell the more keen they’ll be to continue with the promotion and therefore the more opportunities for us to buy good wines at discounted prices! At under 5€ these wines really are good value! Plus you’ll also be able to taste them in the luxury of your own home whilst Eric and I do the same in the studio and if you want you can text or skype the studio with your questions and comments! We are talking interactive wine tasting here!! If you’re near a radio on Monday 3rd December you might like to tune in to Heat Gold FM (94.1 FM and 94.4 FM), or a computer (www.heatgold.fm) from 14:00 hrs and listen to my Christmas Wine Recommendations on Eric Taylor’s programme. There will be some good tips for wines you might want to enjoy over the festive season plus lots of chat about wine stuff with Eric, who loves a glass now and now! I’m hoping to post here the wines that we’ll be tasting, before the event, so that you will be able to buy them and taste ‘with’ us! So watch this space! BAY RADIO – NEXT LIVE WINE TASTING! The next live wine tasting on Bay Radio’s Sunday Brunch programme will be on Sunday 26th August, 12:00 hrs – 13:00 hrs. You can tune in and/or listen through the internet, www.bayradio.fm, click Listen Live! We also invite your calles/e-mails during the programme for any suggestions/comments/questions you may have – why not join the party! The idea is that I recommend a couple of wines to accompany the recipe(s) that Noelle has designed – the recipe details are read out along with the method and my role is to talk about the wines that will be a pefect match for the food, and why I believe this is so. I also give some details about the bodega, the wine itself, the area of production etc – and it’s all done with a sense of fun! There are many listeners who follow the recipes and the wine recommendations and often people ask where the recommended wines can be bought. Please join us on Sunday 26th August 12:00 – 13:00 hrs! Pairing food with Spanish wine - it's a tough life! 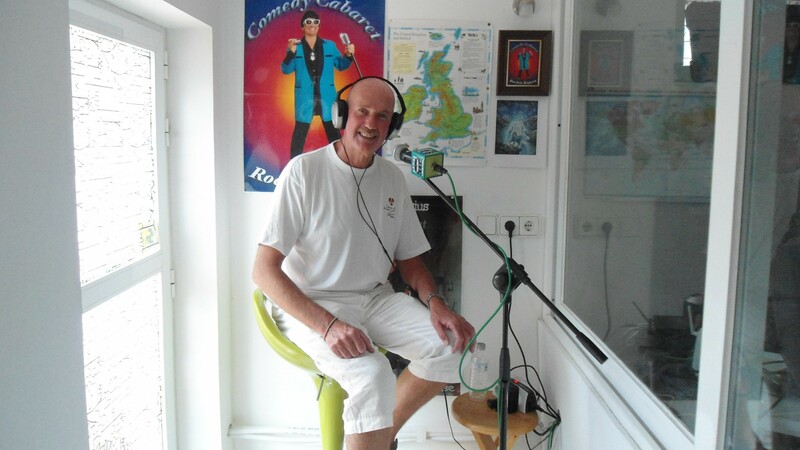 Thursday 12th July saw me at Vince Tracy’s broadcasting studio in La Nucia (www.vincetracy.com) where we enjoyed a recorded chat about wines, restaurants, rock music, football and other stuff of great interest to ourselves and hopefully to others too! Vince has a huge following with something like 3,000 people regularly following his podcasts and his website, plus of course those who go to see his live performances, musical and comedy. He’s well known in the sports world, a Judo expert and accomplished footballer and rugby player as well as an ex-PE Teacher, like myself. He was born in the Wirral and is an avid Liverpool Football Supporter – we have a lot in common! Something of a technophobe myself I was fascinated to learn more about the high-tech (to me at least) world of podcasting and I have to say that his flattering introduction to our podcast of yesterday (now available – www.vincetracy.com click on the right side of the home page, Podcasts, Colin Harkness) is hardly deserved when compared to the hundreds of other interviewees, many of them famous from the world of Pop and Rock, Sport, Entertainment and even the odd Politician too (well, they’re all odd, aren’t they?!). A great experience for me – and we’ve agreed to add to this starter, as time goes on, so please keep a look out on Vince’s website, www.vincetracy.com ! In the Podcast hot-seat, with Vince in various guises behind! BAY RADIO – LIVE WINE TASTING!! July – Another month means another live wine tasting on Bay Radio’s Sunday Brunch Programme – and you can be a part of it! 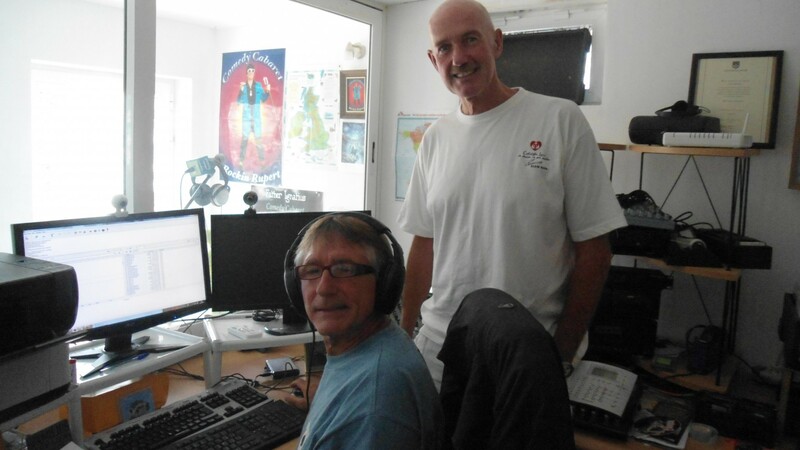 Simply tune in to Bay Radio and/or listen by internet (www.bayradio.fm click Listen Live) 12:00 hrs – 13:00 hrs on Sunday 8th July and have some wine fun! I’ll be recommending two wines to go with the two recipes that Noelle provides from her extensive list of tasty and easy to make meals. This week, I’m told it’s two different types of curry – just what the doctor ordered! But what about wines to match spice-laden meals? Well listen in and you’ll find out! You can call/e-mail/text the studio whilst we are on-air adding your suggestions and comments and asking any questions you may have! It’s always fun and informative – please join us! Live WineTasting at Bay Radio! Check it out – Sunday 8th May! I know many of you listen regularly to our on-air wine/recipe pairings on Bay Radio – it’s a very popular part of the Sunday Brunch programme presented by Noelle and Bob, with me doing the wines! 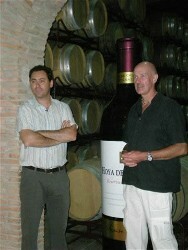 Well the July tasting (they are held monthly) will be on Sunday 8th July from 12:00 – 13:00 hrs, Spanish time. You can listen live wherever you are in the world at www.bayradio.fm click Listen Live. You are more than welcome to call/emial the studio, during and after the programme with any comments and questions – it’s fun and informative and we’d like you to be a part of it too! Please note that the next on-air wine tasting on Bay Radio’s Sunday Brunch programme will be on Sunday 10th June from 12:00 hrs. I’m looking forward to revealing a new wine or two to listeners and to the general wine chat that occurs. We listened to Total 91.8 FM for the first time last week and enjoyed the show. Colin was very good, with a mixture of good records and interesting chat.